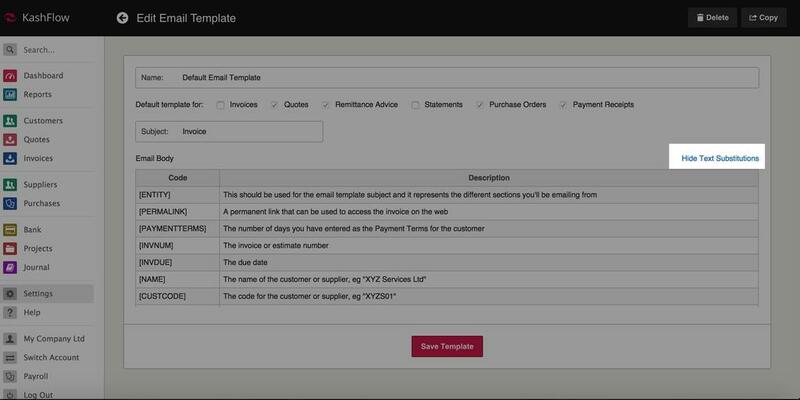 KashFlow supports dynamic text substitutions in both the e-mail body and on the invoice itself via the footer or additional text box. Please find attached your invoice for [TOTAL]. Please pay this by [INVDUE] as per our standard payment terms of [PAYMENTTERMS] days. If you need to get in touch with us regarding this invoice, please use the reference [INVNUM]. Please find attached your invoice for £19.99. Please pay this by 25/12/2012 as per our standard payment terms of 30 days. If you need to get in touch with us regarding this invoice, please use the reference 252. Below is the list of text substitutions and what they display. [PERMALINK] – A permanent link that can be used to access this invoice on the web, can be used on e-mail only. [PAYMENTTERMS] – The number of days you have entered as the Payment Terms for the customer, can be used on both e-mail and invoice, can be used on both e-mail and invoice. [INVNUM] – The invoice or estimate number, can be used on both e-mail and invoice. [INVDUE] – The due date, can be used on both e-mail and invoice. [NAME] – The name of the customer or supplier, eg “XYZ Services Ltd”, can be used on both e-mail and invoice. [CUSTCODE] – The code for the customer or supplier, eg “XYZS01”, can be used on both e-mail and invoice. [CUSTREF] -The code for the Purchase Order or Quote Reference, can be used on both e-mail and invoice. [CONTACT] – The contact name you have entered for the customer, eg “Joe Bloggs”, can be used on both e-mail and invoice. [TITLE] – The contact name title, can be used on e-mail only. [FIRSTNAME]– The first name you entered for the contact, can be used on e-mail only. [LASTNAME] – The last name you entered for the contact, can be used on e-mail only. [TOTAL] – The total amount of the invoice/quote (including any applicable tax), can be used on both e-mail and invoice. [COMPANY] – The company name for the customer or supplier, can be used on both e-mail and invoice. [TEL] – The telephone number for the customer or supplier, can be used on both e-mail and invoice. [FAX] – The customer or suppliers fax number, can be used on both e-mail and invoice. [MOBILE] or [CELL] – The mobile/cell number for the supplier or customer, can be used on both e-mail and invoice. [PAYONLINE] – If you have the PayOnline feature enabled in Settings > Invoice Options > Payments and Discounts then this will give you the payment link, can be used on both e-mail and invoice.